The United States Chess Federation - Essent Wraps with Polgar and Shak on top. Home Page Chess Life Online 2006 October Essent Wraps with Polgar and Shak on top. The Essent tournament culminated Saturday with two more wins by the co-leaders and ultimate winnners, Judit Polgar and Shakhryar Mamedyarov. Both turned in performance ratings solidly over 2900 to finish with 4.5/6 in the double round robin, besting third place Topalov by two full points. 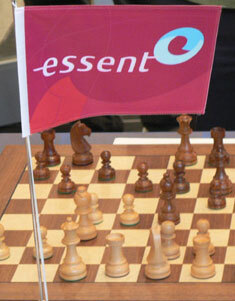 Essent 2006 goes into the history books with an exceptional percentage of decisive games. Just two of the twelve games ended in draws. Polgar beat the soon-to-be-ex-2800 rated Topalov twice, including a wild last round win with black. Contrary to her first win last week ( see Schaak, Awe & Poetry) in which she chased Topalov's king half way across the board to its A-file demise, Saturday's final round featured a successful king evacuation. Judit fled over nine squares before reaching safe harbor on a6. On the other glass-piece-adorned board, Ivan Sokolov mysteriously simplified into a losing king and pawn ending against Mamedyarov, to finish at a miserable 0.5/6, which allowed Mamedyarov a share of first place. "Shak" had earlier beaten Polgar impressively, and edged her on tiebreaks. A few minutes of video is available on the Dutch Doggers-Schaak site. Topalov will have a chace to reassert his position atop the rating list back in Holland in January, at Corus. He may also avenge his world championship loss to Kramnik, as the later has decided to play in Wijk aan Zee after skipping 2006. While the top grandmaster boards will be absent stars and stripes (no Americans are playing this year), the field will be the strongest in 2007 with 6 of the world's top 10 participating.